Key words: GNSS, standards, best practice, calibration. Surveyors as professionals must fulfil certain legal, regulatory and/or accuracy requirements for their clients. Typically they will strive to do this in an optimal cost effective way and with the most appropriate equipment for the job at hand. Naturally it requires a good understanding and assurance in the instrumentation employed. Clients want the most from what they pay for. Legislative authorities as well as private and public companies require confidence that the services rendered are in conformity with globally accepted best practice rules. Generally this involves the application of internationally recognized standards. Considerable efforts have been made concerning testing in the field of surveying. In particular the ISO standard 17123 parts 1 through 8 concerning levels, theodolites, EDM’s, total stations and most recently GNSS field measurement systems in real time kinematic (RTK); have been published. Instrument manufacturers often quote these standards when making reference to their instruments precision. Each of the ISO 17123 standards prescribes test procedures aimed at determining if the instrument is functioning correctly and qualifying its precision and performance. This paper provides a general overview of standards, best practice, testing and calibration related to GNSS. Surveyors as professionals must fulfil certain legal, regulatory and/or accuracy requirements for their clients. Typically they will strive to do this in an optimal cost effective way and with the most appropriate equipment for the job at hand. Naturally it requires a good understanding and assurance in the instrumentation employed. Clients want the most from what they pay for. Legislative authorities as well as private and public companies require confidence that the services rendered are in conformity with globally accepted best practice rules. Generally this involves the application of internationally recognized standards. Best practice is a management idea which asserts that there is a technique or method that is more effective and efficient at delivering a particular outcome than any other. It maintains that with proper processes, checks, and testing, a desired outcome can be delivered with fewer problems and unforeseen complications. Best practice is generally based on repeatable procedures that have proven themselves over time for large numbers of people. The notion of best practice does not commit people or companies to one inflexible, unchanging practice. Instead, it is an approach that encourages continuous learning and improvement. Best practice in a field can be expected to evolve as new information, instrumentation and methodology becomes available. Best practice in surveying and GNSS in particular may have some very job specific aspects associated with it. There may be legal and/or legislative imperatives that do not impact directly on the measurement process and thus strongly influence what may otherwise be regarded as the best practice approach to the job. Nevertheless, and regardless of the specificity of the job; an important objective in a survey is to get the best possible results. This is typically synonymous with the highest attainable precision. For the highest precision, it is generally required to minimize errors. To minimize errors, it is imperative that instrumentation is in proper working order. To ensure that an instrument is fully functional, it is essential to test and/or calibrate it. Few people question that their banking card works at every money machine in the world, but this confidence could not be possible without standards. While driving we stop at hexagonal, not round or square-shaped stop signs. These are just two of the thousands of standards that impact on our everyday lives. A standard is a rule or requirement that is determined by a consensus opinion of users and that prescribes the accepted and (theoretically) the best criteria for a product, process, test, or procedure. The general benefits of a standard are safety, quality, interchangeability of parts or systems, and consistency across international borders. The GIS/Geomatics profession is concerned by several series of ISO standards. There are the ISO 12858 series concerning ancillary devices for geodetic instruments; the ISO 17123 series field procedures for testing geodetic and surveying instruments; and the ISO 191XX (6709, 19104, 19111, 19116, 19127, 19132, 19133, 19134, 19145) family concerning standardization in the field of digital geographic information. They aim to establish a structured set of standards for information concerning objects or phenomena that are directly or indirectly associated with a location relative to the Earth. Of particular interest is ISO 19111 - Spatial referencing by coordinates (i.e. geodesy). The FIG is very actively involved in standardization. A good review of the merits of standardization in the field of surveying is available on the FIG web page dedicated to this subject (http://www.fig.net/standards_network/index.htm). Another important standard that concerns the GIS/Geomatics profession is the ISO 9000 family of standards. The ISO 9000 standards represent an international consensus on good management practices aimed at ensuring that a business or organization consistently delivers products or services that meet the customer's quality and regulatory requirements while aiming to enhance customer satisfaction, and continual improvement in performance. These best practices have been distilled into a set of standardized requirements for a quality management system (ISO 9001:2000). They are applicable regardless of what the organization does its size, or whether it's in the private, or public sector. Best practice in GNSS is a broad field. Nevertheless, there are several commonly accepted generic guidelines that can be regarded as best practice to achieve optimal measurement results. These guidelines typically aim to minimise the errors associated with GNSS measurements. Blunders and human errors due to ignorance and bad survey practice. It should be noted that errors are often more likely to occur or to be exacerbated in RTK surveys because of the relatively short occupation times used. Best practice in GNSS strives to avoid or minimise errors while supplying appropriately documented measurements. This is done by providing (legally) traceable measurements using an (inter)nationally recognised reference network. Furthermore, equipment should be correctly functioning and field tested (ISO 17123 part 8). Finally, properly trained personnel prepared to confront the multiplicity of field situations will always make the difference between a good or bad survey. Typically a survey should be connected into several (at least 3) stations in the reference network. They should become part of the survey and should be used to constrain it. The level of agreement between measured and reference values must conform to the precision required for the survey, the GNSS technique employed and the client accuracy specifications. For example, if one metre accuracy is required using differential GNSS, then the measured and reference values should agree to within 1 metre. The connections to reference stations should be documented, outlining the GNSS technique and reduction process, least squares adjustments, and a comparison/analysis of the derived values. Archiving of raw observation data and results files is highly recommended. One common sense rule in the ISO 9001:2000 standard (chapter 7.6) concerns the control of monitoring and measuring devices. Specifically it requires that whenever necessary to ensure valid results, measuring equipment shall be calibrated or verified at specified intervals, or prior to use, against measurement standards traceable to international or national measurement standards; where no such standards exist, the basis used for calibration or verification shall be recorded. Surveyors have traditionally been very concerned about instrumentation, its functionality and performance. At one time instrument testing was second nature. Today, however with modern survey instruments and their associated complexity, there is a tendency, due to among other things the rapidity and simplicity of the measurement process, to assume the measurements are exempt of error. This of course is not true. Each of the ISO 17123 standards prescribes measurement procedures aimed at qualifying an instrument precision and performance. They also serve to verify if the instrument is in correct operating condition. These tests should be made on a regular basis. For example field tests can be made: at regular six month intervals; before and after a series of precision measurements; after a long period of inactivity; and after transport. Instrument testing (ISO 17123) should not be confused with an instrument calibration. Calibration links the instrument directly to international standards (see Figure 1 below). Calibration is the act of checking or adjusting by comparison with a standard or reference the accuracy of a measuring instrument. A standard or reference is an instrument or method that will measure more accurately and precisely the desired quantity than the measuring instrument itself. For example a laser interferometer measures more accurate distances (relative displacements) than a total station Electronic Distance Meter (EDM). Figure 1. Structure of the notion of traceability, calibration and testing of survey instruments. One of the pillars of instrument calibration is the notion of traceability. Indeed traceability is at the root of all legal metrology and measurement. Traceability is a method of ensuring that a measurement (even with its uncertainties) is an accurate representation of what it is trying to measure. With traceability, it is possible to demonstrate an unbroken chain of comparisons that ends at a national metrology institute (NMI). 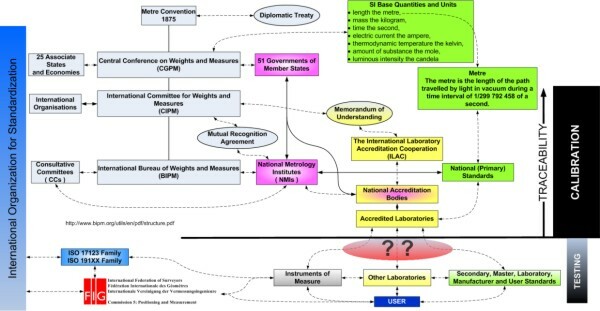 Figure 1 above illustrates the links through the CGPM, CIPM and BIPM to the NMI’s and Accreditation authorities to the user and his/her instrument. Note that traceability is not assured if an instrument is not linked through an accredited laboratory to a national standard. This standard specifies field procedures to be adopted when determining and evaluating the precision (repeatability) of Global Navigation Satellite System (GNSS) field measurement systems (this includes GPS, GLONASS as well as the future systems like GALILEO) in real-time kinematic (GNSS RTK) and their ancillary equipment when used in building, surveying and industrial measurements. Primarily, these tests are intended to be field verifications of the suitability of a particular instrument for the required application at hand, and to satisfy the requirements of other standards. They are not proposed as tests for acceptance or performance evaluations that are more comprehensive in nature. The results of the test are influenced by several factors, such as satellite configuration visible at the points, ionospheric and tropospheric conditions, multipath environment around the points, precision of the equipment, quality of the software running in the rover equipment or in the system generating the data transmitted from the base point. The test field consists of a base point and two rover points. The location of the rover points must be close to the area and in time to the task concerned. The separation of two rover points is between 2 m and 20 m. The horizontal distance and height difference between two rover points are determined by methods with precision better than 3 mm other than RTK. These values are considered as nominal values and are used simply to ensure that the GNSS measurements are free of outliers. The standard proposes two tests: the simplified and the full test procedures. The simplified test procedure consists of a single series of measurements and provides an estimate of whether the precision of the equipment is within a specified allowable deviation. The simplified test procedure is based on a limited number of measurements so a significant standard deviation cannot be obtained and no statistical tests are applied. The full test procedure is used to determine the equipments best achievable measure of precision. It comprises three series of measurements and is intended to determine the experimental standard deviation for a single position and height measurement. the measure of the capability of comparison between different precision of equipment achievable under similar conditions. Statistical tests are applied to the test results. This paper has aimed to review standards, calibration, testing and best practice in GNSS. It is necessarily brief. Nevertheless, no one can doubt the importance of standards and best practice in the modern world. Surveyors are becoming more and more involved in the standardization process. This is clearly underpinned by importance standards have taken on in geomatics profession and the FIG today. One important aspect of standards is the periodic testing and calibration of survey instruments. The ISO standard 17123 Optics and Optical Instruments - Field Procedures for Testing Geodetic and Surveying Instruments is concerned with survey instrument testing. In particular part 8 of this standard GNSS field measurement systems in real time kinematic (RTK) outlines a commonly accepted method to be adopted when determining and evaluating the precision (repeatability) of Global Navigation Satellite System (GNSS) field measurement systems (this includes GPS, GLONASS as well as the future systems like GALILEO) in real-time kinematic (GNSS RTK) and their ancillary equipment when used in building, surveying and industrial measurements. ISO, ISO 17123 Optics and optical instruments - Field procedures for testing geodetic and surveying instruments Parts 1 to 8. 2001-2007, ISO: Geneva Switzerland. ISO, ISO in brief International Standards for a sustainable world, I.O.f. Standardization, Editor. 2005, International Organization for Standardization. Greenway, I., FIG Guide on Standardisation. 2006, FIG Task Force on Standards. ISO, Quality management systems — Requirements. 2000: International Organization for Standardization. Wübbena G., S.M., Mader G., Czopek F. GPS Block II/IIA Satellite Antenna Testing using the Automated Absolute Field Calibration with Robot. in ION GNSS 2007. 2007. Fort Worth, Texas, USA. Staiger, R., Le Contrôle des Instruments Géodésiques. XYZ Revue de l'Association Français de Topographie, 2004. 99(2): p. 39-46. David Martin is head of the ESRF Alignment and Geodesy Group. He holds an MSc in Surveying from the Department of Geomatic Engineering, University College London. He is the chair of FIG Working Group 5.1 Standards, Quality Assurance and Calibration. He has published a number of papers concerning accelerator alignment, survey instrument calibration and hydrostatic levelling systems.